Each year, The Financial Times releases their ranking of the best MBA programs for entrepreneurship, helping up-and-coming entrepreneurs to make informed choices about the best program for their career and startup goals. Its latest ranking, for 2018, has just been released. The 2018 ranking of the top MBA’s for entrepreneurship compiled fifty schools from around the world. A number of factors went into determining which schools would make the grade, including the percentage of graduates who started a company after earning their degree, percentage of female entrepreneurs, the extend to which funding from the school or from the school’s alumni network helped in the creation of new businesses, and more. These factors combined would help decide in what position a school would fall on the ranking. This year, schools in the United States took the top three spots on the list: the Stanford Graduate School of Business, the F.W. Olin Graduate School of Business at Babson College, and the Tuck School of Business at Dartmouth College. 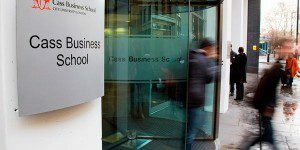 Two UK business schools—the Lancaster University Management School and the Cass Business School—rounded out the top five. At Stanford, although it still ranked as the best school for entrepreneurship globally, there was actually a significant drop since in the number of students starting a business within three years of graduation. This year, it was just 22 percent of students compared with last year’s 36 percent. Babson College’s Olin Graduate School of Business also witnessed a drop; from 52 percent last year to 37 percent in 2018. One explanation for the drop, however, is not that interest in entrepreneurship is declining, but instead being taken on more as a ‘side hustle’ than a full-time career. This was certainly the case for Samantha Penabad, a former strategy manager at Accenture and MBA at Berkeley’s Haas School of Business, who has been working on a digital donation platform called GivingFund. Although she didn’t intend on becoming an entrepreneur when she started business school, tutors at the university helped her to develop a business plan and a fellow student with finance experience joined as a co-founder. The service is scheduled to launch later this month. But GivingFund remains a side job for Penabad, who will be taking on a full-time job in strategy and operations at Google in New York after graduation. As a result, someone like Penabad will be not be included in data for students starting businesses after graduation, but among those accepting full-time jobs. Students pursuing similar paths—working full-time but starting businesses on the side—may help explain the dip in entrepreneurship that many MBA programs are witnessing. Guthrie Jones, an MBA at London’s Cass Business School, holds a similar philosophy. Although he had no intention of getting into entrepreneurship, he couldn’t stop thinking about one particular business idea and decided he’d have to pursue it. Guthrie believes his company, Icepick, which lets people rent out space on their hard drives, has the potential to become a global business. Still, if he right opportunity for a salaried role came up after graduation, he would gladly shift his plan to the side.